Meltco™ Treated de-icer is one of the most economical products on the market. This unique formulation has been designed to quickly and effectively de-ice and anti-ice variety of surfaces. meltco™ Treated de-icer lowers the freezing point of the surface to make the melting process very gentle. The non-caking formula along with anti-corrosion additives extend the shelf life of the product and make it easy to use. Each granulation of meltco™ Treated de-icer is coated with MCi3 solution. The MCi3 solution is formulated with organic elements extracted from sea water. Its natural ability along with minerals and micro nutrients buffers the effects of chlorides on vegetation and environment. 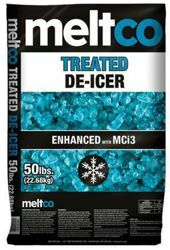 meltco™ Treated de-icer has no nitrogen or phosphorus added to make it an ideal snow and ice melting solution around any body of water.